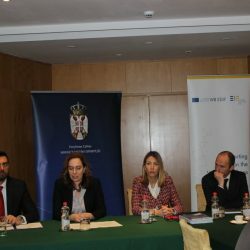 A highly attended event was organized in Belgrade, on 16 March 2018, where the European Investment Fund presented the recently launched Call for Expression of Interest under the “EU for Serbia – Financing for SMEs“. After the opening of the event and welcoming remarks by Ms. Katarina Obradovic Jovanovic, Assistant Minister from the Ministry of Economy and Mr.Steffen Hudolin, Head of operations at the EU Delegation to the Republic of Serbia, Ms. Ines Hobdari, EIB and Mr. Marco Giuliani, EIF illustrated the EIB group activities in the region, especially in Serbia and introduced the new Guarantee facility for Serbia, as part of the WB EDIF platform. In the second part Mr. Bernardo Ghilardi and Mr. Kostas Papachristopoulos, EIF, presented the new Guarantee facility for Serbia in detail as well as the selection procedure for financial intermediaries. An informal networking took place after the event and the EIF, being the manager of the Facility, is soon to expect the first applications. 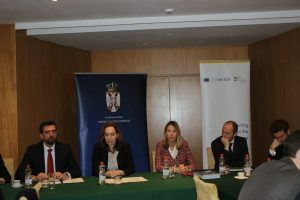 The EU for Serbia – financing for SMEs initiative is a special guarantee instrument dedicated to the Republic of Serbia within the Western Balkans Enterprise Development and Innovation Facility (WB EDIF). This dedicated window is promoted by the Ministry of Economy and is implemented by the EIF. More about how to apply for the open Call can be found here: EU for Serbia – Financing for SMEs.